STANDARD 4 MANAGEMENT Candidates demonstrate knowledge, skills, and dispositions to plan, organize, coordinate, and supervise instructional technology by applying principles of project, resource, delivery system, and information management. I met Standard 4.1 through this semester-long project because I planned, monitored, and designed the entire project. I determined an actual program I could evaluate, designed an evaluation plan to determine if objectives were met, and made recommendations to stakeholders for improvement. This project involved monitoring the program and the evaluation plan throughout and using gap analysis to determine where things were and where they needed to be. It opened my eyes to program evaluation, especially since I live near so many international NGOs in need of evaluations. I might consider small-scale evaluation projects in the future. While also mentioned under Standard 1.1, I have included it here because Project Me shows my ability to plan, monitor, and control an instructional design project from the ground up. Taking nothing more than an idea, I created a project based learning self-exploration unit that could also be used as a stand-alone elective or as an after-school activity. I developed all supporting resources, including products and performances, assessments, project timeline, teaching guide, and additional support resources for instructors. I have been invited to share this project as a learning session station during ISTE 2013 this summer. While this assignment is discussed specifically under Standard 3.2, I have also included it here because it meets this standard by implementing task force planning strategies to allocate state resources. It also required our technology management team to plan, monitor, control, and make difficult decisions about resource allocation. We analyzed resource allocation through the larger lens of digital inequality. Living in a developing country, I am no stranger to the so-called “digital divide.” Telecommunication infrastructure and frequent power outages limits Internet connectivity. Still, many people visit their local “cyber” for Internet access and can perform basic functions. This assignment opened my eyes to the complex issues surrounding policy and practice in the U.S. Part of me wonders if the divide is lengthened by the expectation of ease and convenience. Here in Nepal, it is not assumed that anyone has reliable connectivity, but with a little effort most are still able to access information and perform basic tasks. In the U.S., it is often assumed that just because people don’t have all the bells, whistles, and speed on a personal device at home that they are part of the divide, when they could still use school computers or public computers at the library. This assignment strengthened my management skills that have been called into play as I now plan, monitor, and make recommendations for technology purchases at my school and in my technology outreach efforts. Through the process of crafting a real grant proposal, I met this standard by getting into the details of what resources should be requested in the grant and how they would be used, controlled, monitored, and reported on. The grant writing process is complex and requires a significant amount of research and planning. Such an exercise requires a thorough examination of the project from beginning to end, with all costs, rationale, support, arguments, and practicalities addressed. This grant was actually awarded and has been a great source of satisfaction and achievement for the class. Delivery system management involves planning, monitoring and controlling ‘the method by which distribution of instructional materials is organized’ . . . [It is] a combination of medium and method of usage that is employed to present instructional information to a learner. When I completed this assignment early in EdTech501, RSS feeds were new to me. I hadn’t realized their advantage. Through this assignment and many practical applications since then, I demonstrate mastery of this standard through organizing the method of instructional material delivery. This assignment is a publicly shared list of RSS feeds I added to Google Reader. It is an attempt to bring information to me rather than me going to find it. While RSS feeds (the medium) is available to everyone and can be a huge aggregator of information and time-saver, it is up to individuals to actually use them to their advantage (the method.) I may not check Google Reader daily, but I like that I have knowledge related to my professional and personal interests sitting there waiting for me to read. I’ve helped several others, including class parents and high school teachers, follow RSS feeds on websites of interest. This assignment also shows mastery of this standard as it led me through organizing my personal learning environment growth into a visual format that could be (and has been) shared with others. This idea of growing our network, of growing ourselves, aligns well within connectivist framework. Like George Siemens said, “The learning is the network” (2004). I chose which resources best represent me, brought them all together into one place, and organized them in a way that made sense. This Pinterest board is a visual depiction of my personal learning environment: favorite websites, online learning communities, productivity tools, professional development ideas, and other resources that capture the brilliant intersection of education and technology. In short, it is my digital footprint. It is me. 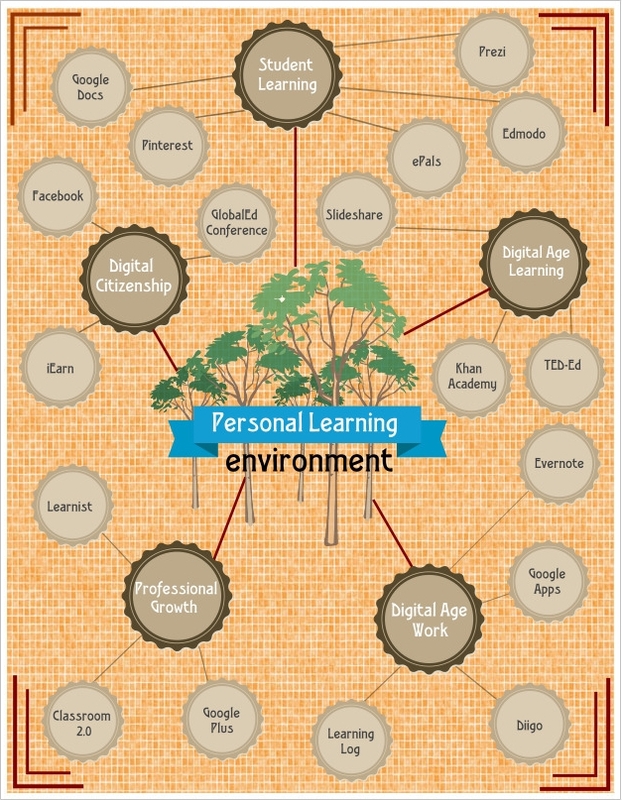 For the same assignment, I also created a separate diagram that visualizes the network, nodes, connections, branches, growth, or other relationships that are core to a PLE. I attempted to align my communities and resources with the NETS for Teacher standards. It was the first time I’ve really mapped my efforts against these standards and I realized I fare pretty well so far. Zotero was a completely new research tool to me, and once I discovered it I wondered where it had been all through my previous research-paper-writing days. To meet Standard 4.3, this assignment helped us collect, organize, annotate, format, and share our research. In and of itself, this assignment model was brilliant and I recently referred to it during my Google Apps for Education Summit presentation. The professor knew that we were new to the program and likely needed a refresher on APA formatting, so she took an otherwise mundane task and turned it into a powerful collaborative activity. She created the shared doc, asked that we each paste the 5 references from our paper into it using correct APA formatting, and then we made comments and suggestions on how each other did. We became the teacher and the expert on a topic we really knew very little about. It made us dig deeper and help each other, and boosted our confidence in our APA skills. It gave us a safe place to try it out, and as a result I have felt confident in APA formatting ever since. To this day, I never read a research article without the assistance of Zotero. If anything shows my growth throughout this program, or mastery of Standard 4.4, it is my learning log. Encouraged to set it up during the first weeks of my first course, I have spent a significant amount of time and effort to keep it going. It is a place where I post or embed assignments, reflect on what I have learned, and map each assignment to appropriate AECT standards. It is an extended version of an ePortfolio. It has required significant planning, monitoring, aggregating of resources, and time. It also involves technical skills to allow for storage, organization, and formatting resources. Perhaps most valuable, though incredibly time-consuming, are the reflections. These have allowed me to really focus on what I have learned and on greater issues than the assignment at hand. I have a solid academic following and feel pleased with the quality of work I’ve been able to share.